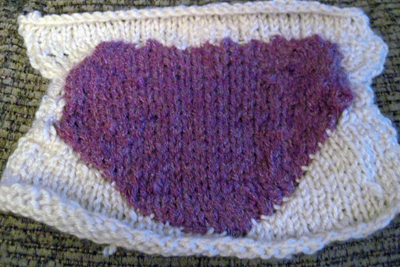 This past Friday I bought a book, which inspired me to learn intarsia. So, Sunday I grabbed some straight 8’s and two colors of worsted weight yarn and dug in with minimal research. I thought I had this figured out. Nah, I’ll just skim over another book and see what they have to say, and I think I’ve got it, I thought to myself. Turns out, I had the right idea, but the wrong technique. Ever happen to you? As I went along, it was apparent that maybe I wasn’t doing something right. 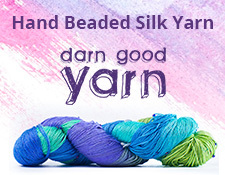 For example, I thought that each color change was done with a separate strand of yarn. I managed to get a pink blob, as you can see from Exhibit A, that somewhat resembled a heart. It took FOREVER to knit, and I had a hojillion ends to weave in, which took about as long to do as knitting the darn thing. I figured this was OK for a first attempt, but I was going to do more research the next day. One thing I DID do right was read the chart correctly. I’ll give myself credit for that. Monday came and I did a little search on intarsia knitting tutorials. Knit Picks had a good one, and I’ve used theirs before, so I figured I give their instructions a try. I read them. One point I missed: use yarn bobbins to knit sections of color. OH! Another: Carry the new yarn you are using INBETWEEN the old one and the fabric. OH! The proverbial light bulb went off in my brain and the technique clicked. That evening I got the same supplies I had before, plus some newly purchased yarn bobs. I cast on and followed the tutorial. Ding! I got it! See Exhibit B? It actually resembles a heart! There are mistakes in it, mostly because I was tired when I was finishing the pink part. What’s important, I learned something new. I can do this! The moral of the story: Always read your directions fully and completely. If you’re still not sure, do more research. 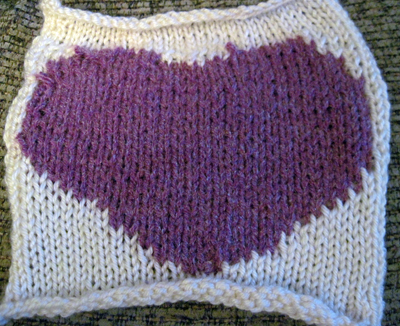 I can’t wait to do more intarsia. This has opened a whole new world of knitting for me. Fair Isle, you’re next! Next Next post: I went the beach, and this is what I did.